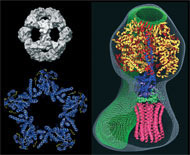 We aim to determine the atomic structure of interesting or important membrane proteins and membrane protein complexes. Although much can be done using existing methods and approaches such as X-ray crystallography of 3D crystals or electron crystallography of 2D crystals, there are still many structures that have resisted our best efforts to crystallise them even when significant amounts of pure material have been obtained. There are two main problems. First, many membrane proteins, including most G-protein-coupled receptors, are relatively unstable after purification in detergent: for this class of membrane proteins, Chris Tate and his colleagues in the LMB have recently developed the method of conformational stabilisation (Serrano-Vega et al (2008) PNAS, 105, 877-882) by combining a number of thermostabilising mutants to create much more stable molecules. This has made it possible to tackle structures that were practically impossible previously. A second problem is that X-ray or electron crystallography needs well-ordered crystals that diffract to high resolution. Since the recent introduction of direct electron detectors and improved computer programs, the resolution of single particle electron cryomicroscopy (cryoEM) has been greatly improved to the extent that it is now a serious alternative to crystallography. In many but not all cases, atomic structures can now be obtained using single particle cryoEM. We are therefore working to improve the imaging methods, the computer programs for image processing, and the efficiency of electron detectors, with the goal of realising the full potential of cryoEM for analysis of single particle structure at atomic resolution. Quart. Rev. Biophysics 49: e13, 1-25. J Mol Biol 413: 1028-1046. Quarterly Reviews of Biophysics 43: 65-158.